"Error: Couldn't connect to daemon: 127.0.0.1:18081 Height: 1548149/1548149 (100.0%) on mainnet, not mining, net hash 857.62 MH/s, v7, up to date, 0(out)+0(in) connections, uptime 0d 0h 0m 0s 2018-08-20 15:06:06.095 0x7fffa05e2380 ERROR net.http contrib/epee/include/net/http_client.h:456 Unexpected recv fail Error: Problem fetching info-- rpc_request: 2018-08-20 15:12:52.899 0x7fffa05e2380 ERROR net.http contrib/epee/include/net/http_client.h:456 Unexpected recv fail Error: Problem fetching info-- rpc_request: Error: Couldn't connect to daemon: 127.0.0.1:18081"
I downloaded the new version the Monero GUI - v.0.12.3.0. When I try to connect I get "Please check your wallet and daemon log for errors. You can also try to start monerod manually." 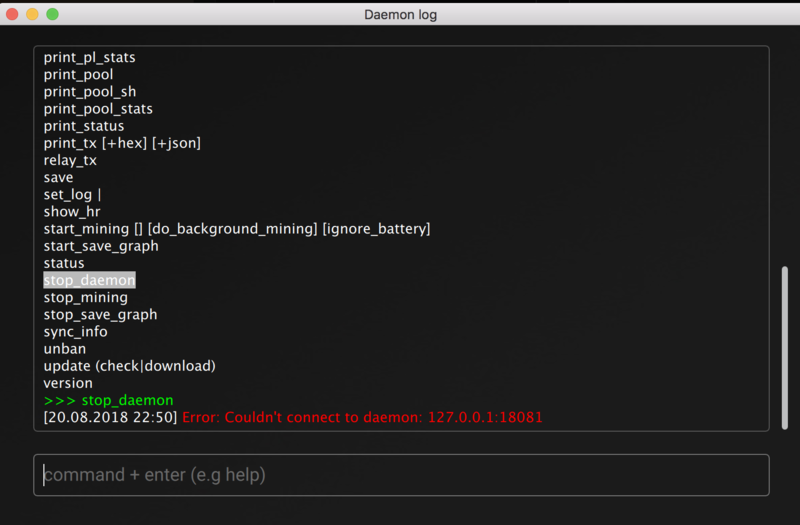 After I go to the daemon settings, I see the same " Error: Couldn't connect to daemon: 127.0.0.1:18081"
"Unexpected recv fail" is typical of a timeout. There were a few relevant issues that got fixed since then, you should update to 0.12.3.0 and try with that. Or 0.12.4.0 if it gets released before you get to update, as it should be soon. Not the answer you're looking for? Browse other questions tagged monero-wallet-gui daemon or ask your own question.